The RP Photonics Buyer's Guide contains 2 suppliers for mode-locked diode lasers. 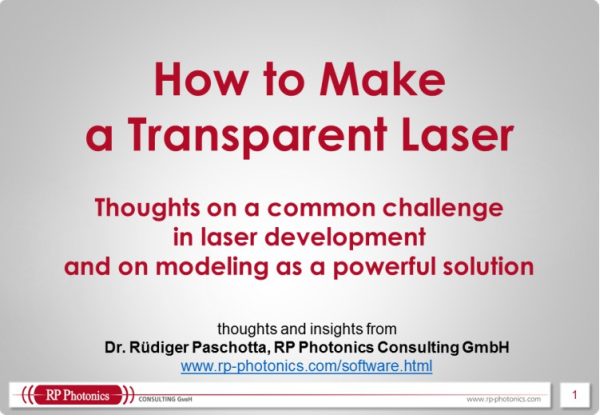 Ask RP Photonics for advice on any kind of mode-locked laser. Dr. Paschotta has very extensive expertise in that area. Diode lasers can be used for generating ultrashort pulses – either with various techniques of mode locking, as discussed in this article, or with gain switching. Typically, pulses with durations between 0.5 and 5 ps and pulse repetition rates between 1 GHz and hundreds of gigahertz are generated with mode locking. In extreme cases, the repetition rate can even be above 1 THz . The main application of ultrafast diode lasers is in optical fiber communications systems, where such lasers function as pulse sources of fast data transmitters or for all-optical signal processing. Active mode locking can be accomplished with an optical modulator in the laser resonator. This is usually either an electroabsorption modulator in the form of an unpumped region with some modulated voltage, or an amplifying section where the drive current is modulated. Passive mode locking relies on a saturable absorber in the resonator. This can simply be an unpumped section of the device. It is common to apply an electrical bias for adjusting the absorber properties. However, the recovery time of that kind of absorber is fairly long. Shorter recovery times are achieved e.g. by implanting nitrogen (N+ or N2+) ions from one facet. This introduces crystal defects, where carriers can recombine. The absorber is often placed at a resonator end, but it can also be placed somewhere within the resonator so that different pulses can meet in the absorber (colliding pulse mode locking). Hybrid mode locking (Figure 1) is a combination of active and passive mode locking. With this approach it is possible to control the pulse timing externally, as in an actively mode-locked laser, while also achieving a shorter pulse duration as in a passively mode-locked device. Figure 1: Setups of two external-cavity hybrid mode-locked diode lasers. Version (a) uses a modulated injection current and a nitrogen-implanted saturable absorber, whereas version (b) has a modulated absorber section. In most cases, a multisegment semiconductor structure is required, containing not only a gain section, but also an absorber or modulator section, and possibly additional means for e.g., repetition rate control. For pulse repetition rates roughly below 10 GHz, an external cavity setup is usually required, as a monolithic device would become too long. The laser resonator usually has the semiconductor chip on one end and is completed with bulk-optical elements, at least a collimation lens (e.g. a GRIN lens) and an end mirror. Another technical approach is to incorporate the semiconductor chip into a ring laser resonator made of optical single-mode fiber. In the latter case, the resonator is typically much longer, and allows the use of fiber-optic components. The semiconductor device may then be a fiber-coupled semiconductor optical amplifier (SOA). The pulse repetition rate can be chosen in a wide range, and can easily be tuned e.g. by moving the end mirror, or with a fiber resonator by stretching a piece of fiber with a piezo transducer. It is possible to insert an optical filter for fixing the emission wavelength, or use a diffraction grating as the end mirror (Littrow configuration; see the article on external-cavity diode lasers). Even for higher pulse repetition rates, where harmonic mode locking is required, external-cavity devices can be advantageous, because they have a potential for lower laser noise, e.g. in the form of timing jitter. Therefore, mode-locked external-cavity diode lasers sometimes compete with mode-locked fiber lasers in areas where monolithic laser diodes would not be suitable. On the other hand, a monolithic setup with fundamental mode locking can be very compact, much cheaper to manufacture, and can exhibit very robust pulse emission. The pulse energy is fairly limited – often far below 1 pJ. Average output powers are often below 1 mW. Due to the short upper-state lifetime, ultrafast semiconductor lasers are generally not suitable for lower repetition rates of e.g. well below 1 GHz, except with synchronous pumping. Although the gain bandwidth of semiconductors would be compatible with pulse durations of a few tens of femtoseconds, the pulse durations achieved are usually much longer – at least hundreds of femtoseconds, and often picoseconds. The pulse formation dynamics are relatively complicated, e.g. due to nonlinear phase changes associated with gain saturation, and difficult to optimize. The pulse quality is normally not as good as e.g. for mode-locked fiber lasers. In particular, there are often additional satellite pulses, caused e.g. by imperfections of the anti-reflection coating. Also, the pulses are often chirped, i.e., they are not bandwidth-limited. The timing jitter and the noise of other pulse parameters are higher than for other mode-locked lasers. This is partly a consequence of the low power level. Diode lasers are not the only semiconductor lasers which can be mode-locked. There are also vertical external-cavity surface-emitting lasers, which can be optically pumped. This approach has a potential for much higher pulse energies and average output powers up to several watts, and has also been demonstrated to work in a wide range of pulse repetition rates from a few gigahertz to tens of gigahertz. Such lasers can in some areas, particularly for high pulse repetition rates, even rival mode-locked doped-insulator bulk lasers.